Say goodbye to ice scrapers, gloves, and snow shovels; spring is finally here! Spring is the season of growth, renewal, and fresh starts, which makes it the perfect time to focus on growing your small business by hosting a giveaway. Read on to learn how a spring giveaway can help your small business bloom. Plus, we’ve included a few prize ideas and examples to inspire you to be creative with your next contest or giveaway. Growing a small business is hard work; particularly if you are trying to do it all. If you are tired of spending money on advertising that doesn’t get results, consider trying a giveaway. When managed well, a giveaway is an effective way to get your name in front of people who haven’t heard of you and reward those who already love you. Why do they work so well? There are a few reasons giveaways are so effective. For starters, people like free stuff. Think about the last time you went to a fast food place and found an extra dessert in your bag or got a large fry when you ordered a small. It gave you a little warm and fuzzy feeling, right? Now when you think about that brand, you associate it with positive feelings. Giveaways do the same thing, with the added benefit of raising awareness of your brand. When you pair the feel-good feeling of free stuff with the hope and excitement of spring (bye, winter blues! ), you’ve got a recipe for making people feel all sorts of warm and fuzzy feelings. In addition to making people feel good, giveaway posts are more likely to be shared. This helps to increase the reach of your contest, as well as your brand. Not sure what to give away? Here are a few ideas and examples to inspire you. Partner with several other local businesses to create a curated box of local items. Just make sure to choose a theme that would appeal to your audience. For example, if you own a women’s clothing boutique you could offer a manicure gift card from a local nail salon, goat soap from a local artisan, sweet treats from a local vegan bakery, and a free personal shoppers appointment at your boutique. Here is an example from The Natural Lighting Company, who offered a “Basket Full of Sunshine” to banish winter blues. Or, if you own a local restaurant, you could offer a gift card for dinner, a bottle of local wine, and a pair of nice wine glasses. By pairing with other businesses to create your prize, you reduce the investment for yourself and increase the number of people who enter by having all businesses cross-promote. So, it’s cheaper and more effective. Most people don’t spend enough time with the ones they love, and this prize gives them the opportunity to do just that. The best thing about a dinner and a movie prize can be customized to your target audience. For example, for parents, you could add on a gift card to a nanny company for babysitting. If you are celebrating the release of a new superhero movie, you could include movie swag. If your target audience is children, you could offer free dinner at a restaurant with a play place. This is one of the simplest prizes on this list, but it can be quite useful, particularly if you are launching a new product. Offer a free full-size product package so the winner can try out all your new flavors or styles. Or, you could create a package of a new product line to encourage people to try them. This won’t work if you already offer a free consult, of course. But it will work for a wide range of businesses, including business coaches, personal trainers, accountants, and so forth. Since all you have to invest is your own time, this keeps the overhead for the giveaway low. Not all prizes need to be free! If you want to keep entries limited to people who are truly interested in your brand, consider offering a deep discount off the winner’s next purchase order. Just make sure to set a value limit. Or, you can offer a small coupon in exchange for an email address, like HD Home Improvement Solutions. Another great prize to keep entrants limited to those who are in your target audience is to offer a free upgrade. For example, a limo company could offer an upgrade to a larger car; a restaurant could offer a $50 dinner for $25, a children’s play place could offer a yearly pass for the cost of a monthly pass. Here is an example from restaurant Ruckus Pizza, Pasta, and Spirits. This type of prize will appeal more to those already familiar with your brand, so keep that in mind when setting your goals for the giveaway. Offer current brand lovers and followers to chance to appear in your next TV commercial or be featured in social media ads. This is a unique experience for the winner and helps increase the value of your next marketing campaign by creating buzz before the ads even launch! You can also pair the model opportunity with a year’s worth of product like PetConect did. Do you host a yearly swanky event? Give away an exclusive invite to drum up excitement for the event and build your brand online. Make it extra special by throwing in a limo ride or gift card to a local boutique for fancy clothing. But you don’t have to host your own event for this prize to work. For example, you can offer tickets or invites to a local award dinner or popular play coming into town (think Hamilton!). This type of giveaway works well because exclusive invites are something they can’t get on their own. Team up with a local celebrity to give away a meet and greet with someone famous in your city. This could be a DJ from a radio station, a local influencer, a newscaster, or even the CEO of your company. 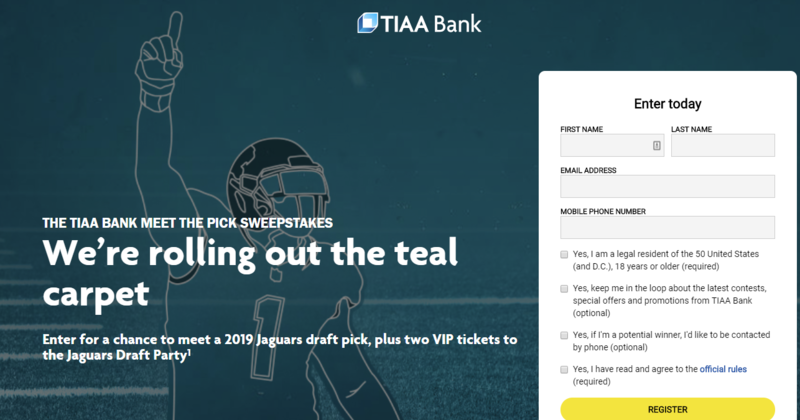 Here is an example from TIAA Bank, which allowed the winner to meet a 2019 Jaguars Draft pick and an invite to the Jaguars Draft Party. If you really want to go big, give away one high-end product. This could be a car from a local car lot, a new wardrobe from a local clothing boutique, or a high-end electronic device. While the prize might cost more, a higher end product drives more excitement which will increase the reach of your giveaway. You can also offer discount coupons or smaller products to second or third place winners. To keep costs low, you could pair with a complementary business and host the giveaway together, like Catch did in their recent giveaway. This one is a little tricky, but can be done well. The issue with offering something like an iPhone or an iPad is the quality of entries. Since these types of products have a mass appeal, everyone will enter regardless of whether they care about your brand or not. But, they can work! Just make sure it aligns with the goals of your giveaway. For example, if you want to increase your email list fast, this is a good option. Not so much if you are looking for qualified leads. If your product lends itself to it, a year’s worth of products can be a great way to build loyalty for your brand. Because the value is high, you are likely to get more entrants. Since the prize is related to your business, you will get more quality entries. Here are a few ideas: a gym could give away a free year membership, a bakery could give away a dozen cookies every month for a year, or a grocery store could give away a free $25 gift card a month. Experiences are a fantastic way to ring in spring. After a few months of hibernating, most people are ready to get out of the house. An experience related to your brand is the perfect way to welcome in the warmer months. For example, if you own a salon, offer a free blow out and tickets to a concert with backstage passes. If you own a restaurant, offer a free dinner with limo ride and tickets to the opera. A local yarn shop could offer passes to a local knitting conference along with hotel stay. As a small business owner, focusing on local experiences shows you care about the community and aren’t just another brand trying to make a buck. Offer tickets to see the local sports team, a play, concert, passes to a museum, or tickets to a local amusement park. These types of experiences attract a wide range of entries, so you are likely to reach more people who haven’t heard of your brand before. Ready To Start Building Your Spring Giveaway? Giveaways are one of the most effective ways to grow your small business. Woobox makes it easier than ever to create effective giveaways, contests, polls, quizzes, and more. Get started creating your giveaway now with a free Woobox account.